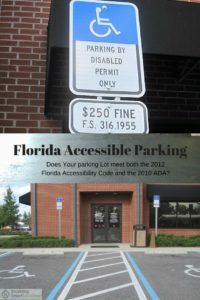 Florida goes beyond the 2010 ADA Standards for Accessible Design to make accessible parking comfortable for a broad population. 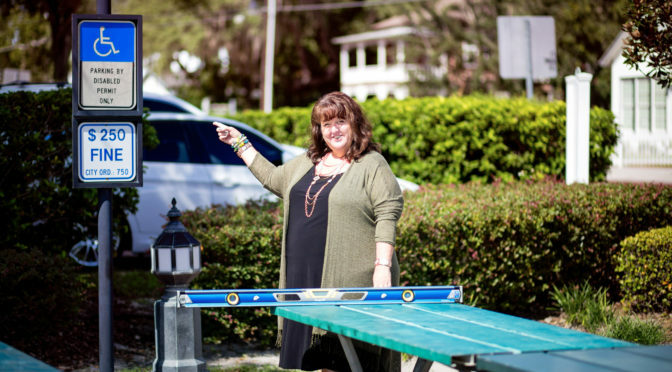 In order to assure that a van with a lift can fit in any accessible space, ALL accessible spaces are 12 feet wide with a 60-inch wide accessible aisle. Every day, I park in lots that do not have accessible aisles with each accessible parking spot. 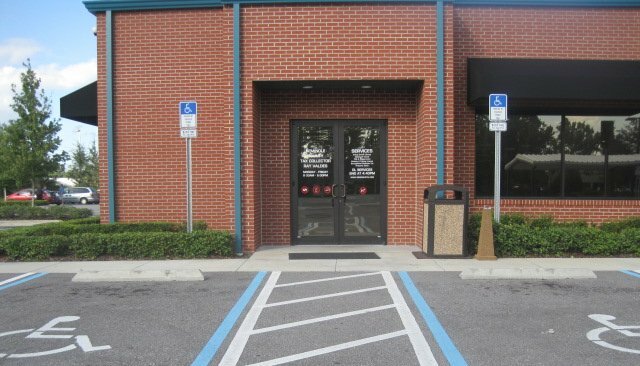 Did you know that a person parking in an accessible spot should always have a 44-inch wide minimum ACCESSIBLE ROUTE to the building entrance? A person parking in an accessible spot should never have to walk or roll behind cars, other than their own, to reach the building entrance. Even with new construction all over Central Florida, I see parking lots without safely accessible routes. Are the “towing” and $250 FINE SIGNS serious? YES. 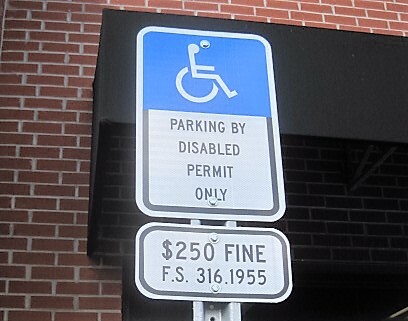 Since 1996, all accessible spots must have the International Symbol, “PARKING BY DISABLED PERMIT ONLY” and the penalty for illegal use of the space. 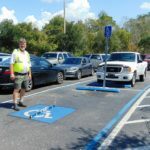 Please take a few minutes to see if your parking lot meets the ADA needs of your disabled employees and guests. If it doesn’t, please take ACTION! 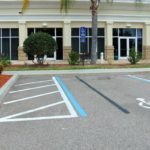 If you need an ADA Compliance Report and Action Plan for your property, we are available for Florida and the Eastern USA. 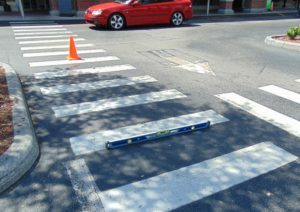 Access FAIL! 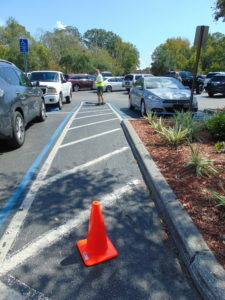 Accessible Parking, YES: Accessible Aisle, YES: Accessible Route, NO!! As an ADA Inspector for architectural barriers, the new construction BLOOPERS never cease to amaze me! Here’s a new 12′ wide accessible parking space with the required access aisle, correct location, and correct signage; yet no ACCESS ROUTE to the Hotel SIDEWALK! 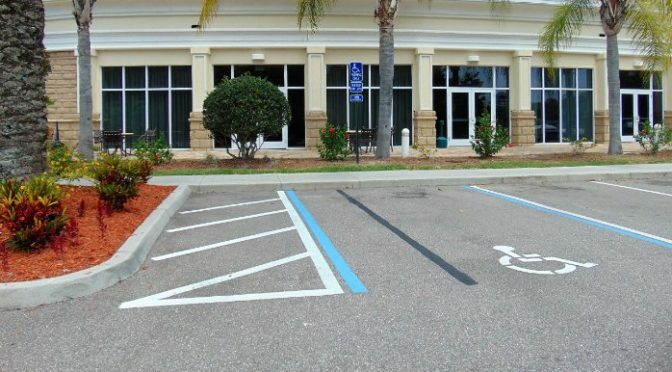 By ADA law, the disabled person parking here should be able to access the hotel entry without having to cross traffic or travel behind any other parked vehicles. Rolling out into the traffic lane, around the planter, and through the portico is not the solution! The ramp down to the driveway pavement is on the other side of the palm tree planter. 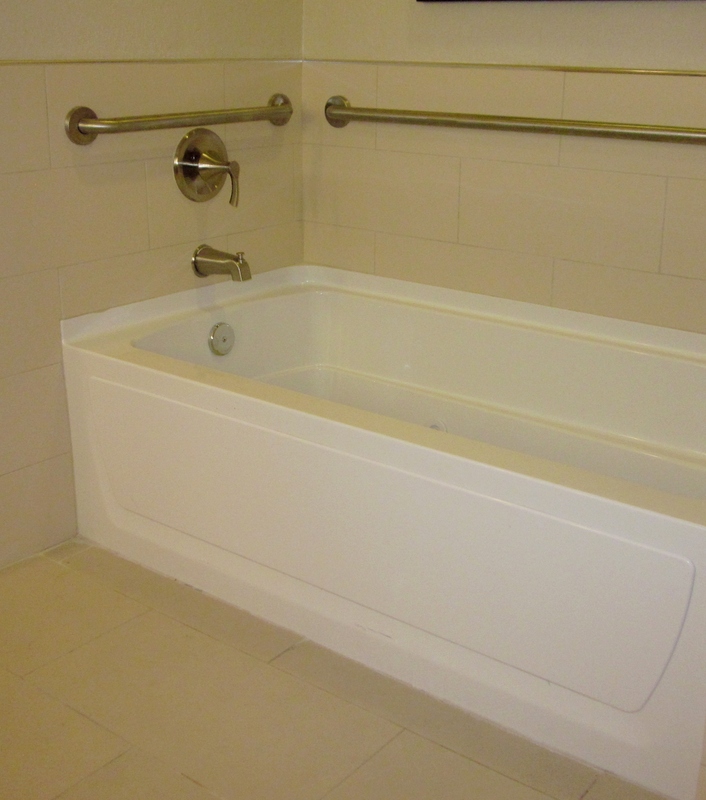 SAFETY is a key component to the ADA Standard. 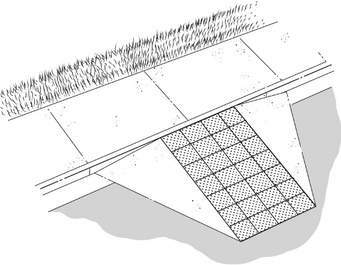 SOLUTION: At no additional cost, the sidewalk could have been designed to ramp down from both sides to a flat landing to meet the access aisle. A curb stop to prevent parked cars from encroaching the sidewalk prevents cars from encroaching an accessible sidewalk are not required, however, they prevent cars from pulling forward and blocking the sidewalk. 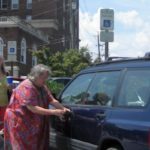 Does anyone with a reasonable conscience believe that a person with a mobility disability should have to stand in traffic to enter and exit their car? 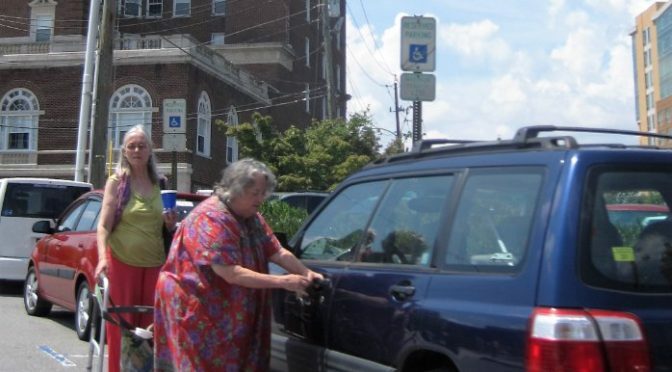 Fortunately, this lady in Asheville, NC had a friend to look out for oncoming traffic. The “Reserved Accessible Parking” space was the same width as all of the other parallel parking spaces. There was NO access aisle between the van and the sidewalk. 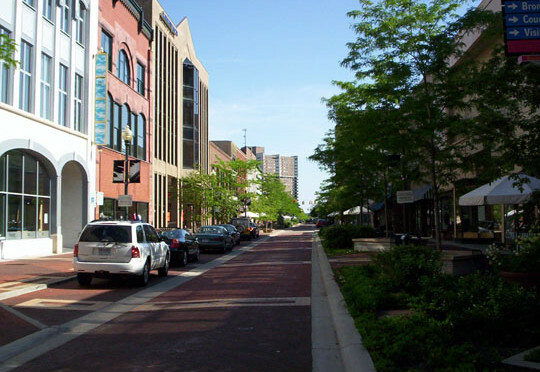 Having safe distributed accessible parking is crucial in redeveloping walkable cities. Non-Accessible on street parallel parking space. The access aisle leads to a raised curb.. Downtown urban renewal. Main-street city. 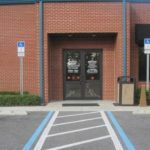 The ADA Code requires all “Handicapped Parking Spaces” to have an access space next to a car or van for a lift for mobility devices. 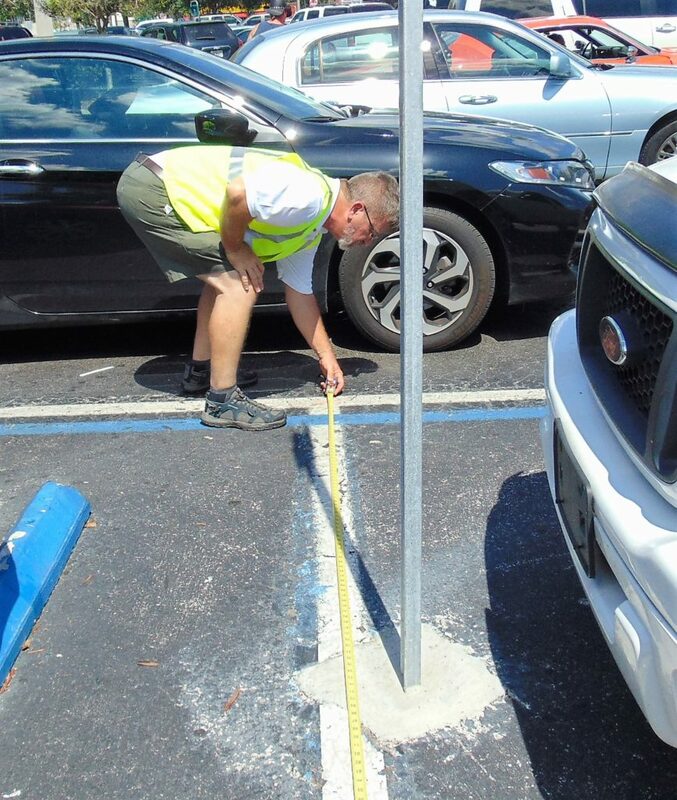 In Florida, all Accessible Parking Spaces must be 12 feet wide plus a 5-foot access aisle for a total of 17 feet. 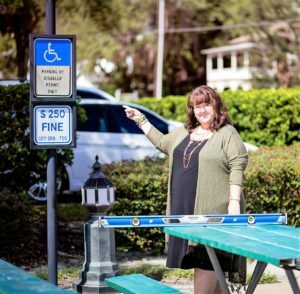 Nationally, ADA requires 8 feet for an accessible car plus an 8-foot access aisle or 11 feet for an accessible van plus 5 feet for an access aisle. 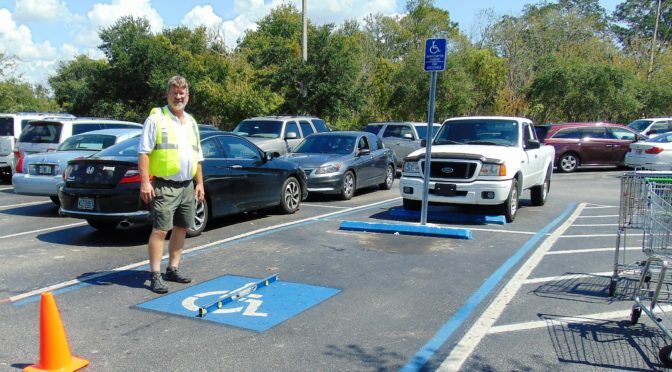 All of the Accessible parking spaces require a total of 16 feet in width. A situation came to my attention today in the City Beautiful. A City that promotes itself as inclusive. A paraplegic, who uses a van with a full lift, purchased an in-fill condominium in a Historic District. The condominium building, a re-purposed award-winning historical retrofit, has individual car parking garages for each unit. Accessible vans are often taller than a standard garage door. In commercial buildings with parking garages, clearances are mandatory for accessible van parking. 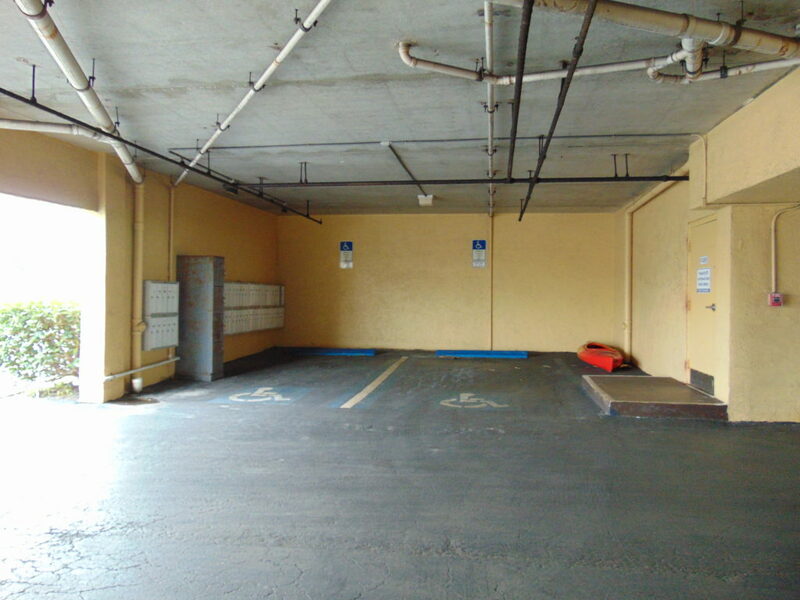 In a smaller unit residential building, standard car height individual garages are allowed. The developer asked the city to allow them to build a van accessible parking space, with an accessible path, to this individuals condo unit door on their own property. The City Historical Board denied allowing the paraplegic woman building a parking space on her property. 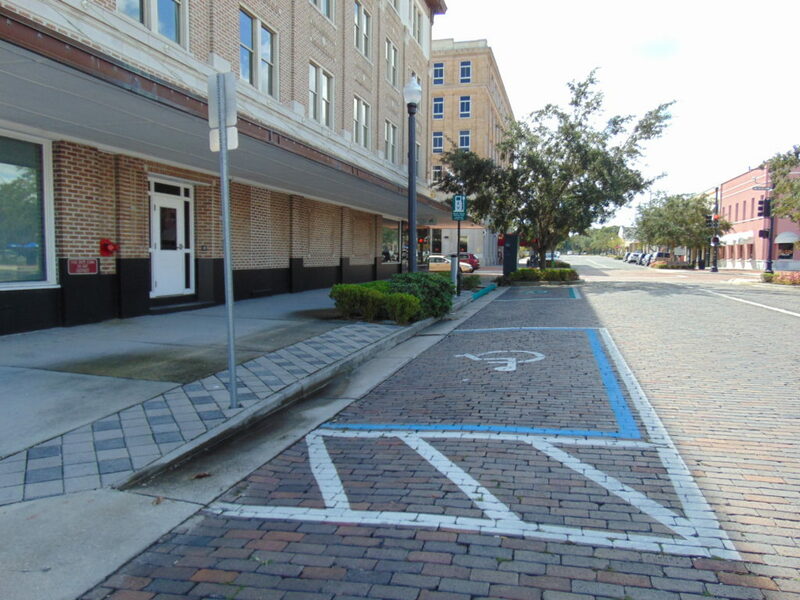 The City Historical Boards solution was that they would add a PUBLIC “accessible parking” sign to one of their existing parallel parking spaces on the existing narrow public street. 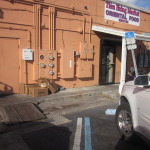 Parallel on-street parking is NOT accessible, without the added side access aisle. Since the accessible parking space requested was for a van, it would have required 17′ in clear width, which certainly wasn’t available on the street. This City board saw their “Historical Code” as a priority over Equal Access . 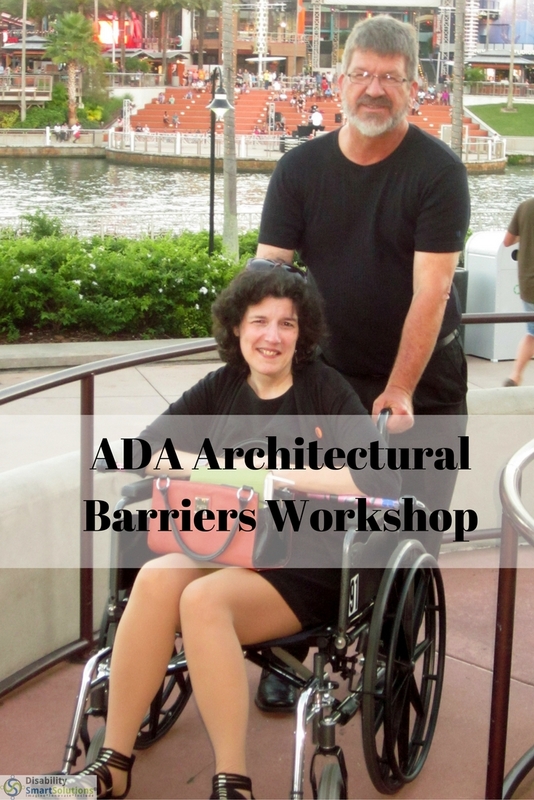 The Department of Justice has worked tirelessly to create the ADA, Americans with Disabilities Act, to assure architectural access for all. 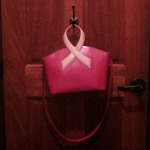 It is possible to design historically relevant accessible features and I am available to show any agency how. 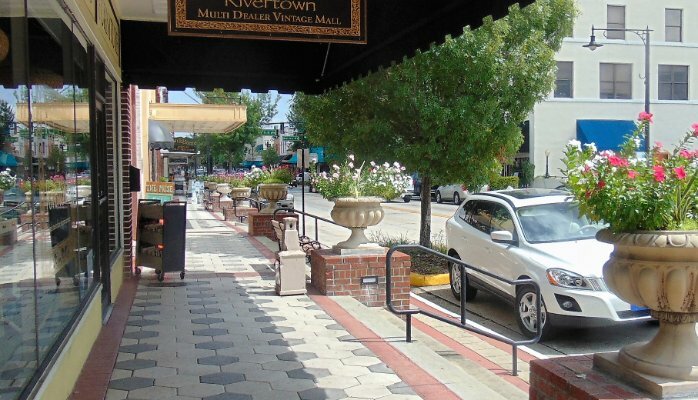 Accessibility is a key ingredient to revitalizing historic Main Streets. Even though we are seeing a trend of millennials living and working in urban cores, Boomers, who have the most discretionary income, are also retiring to places that feel like a “hometown.” The faster our world becomes, the more we are all looking for places with a soul. 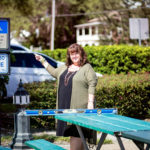 This week I attended the 2016 Florida Main Street Conference in DeLand, where I discovered a disability-smart solution that needs to be shared with historical downtowns everywhere!!! 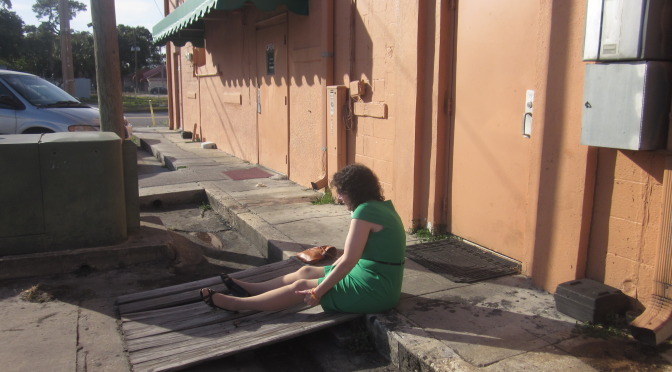 To solve the ADA problem of raised steps at each existing storefront, DeLand raised the sidewalks to create flush accessible entrances. This eliminated costly renovations to existing historical structures. 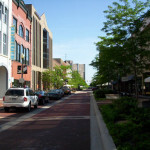 Towards the ends of each commercial block, the sidewalks slope down to the intersection. 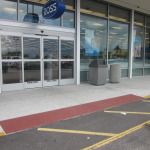 Two other disability-smart solutions in this photo are the landscape barrier between pedestrian and automobile traffic and highlighting the ground level surface with both color and texture changes. I will continue posting Smart Solutions for disability concerns. Until then, please share these solutions with your downtown partners. 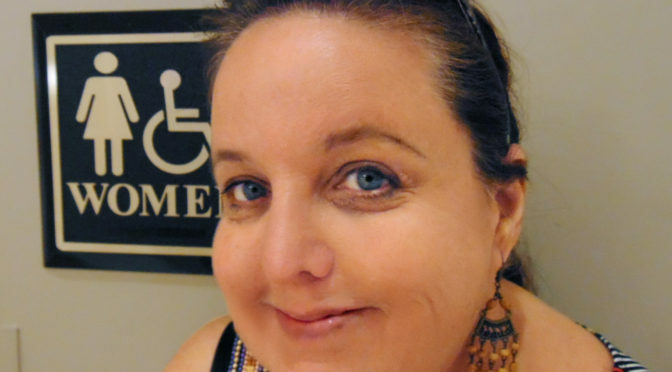 Ignorance of ADA Laws can BITE. 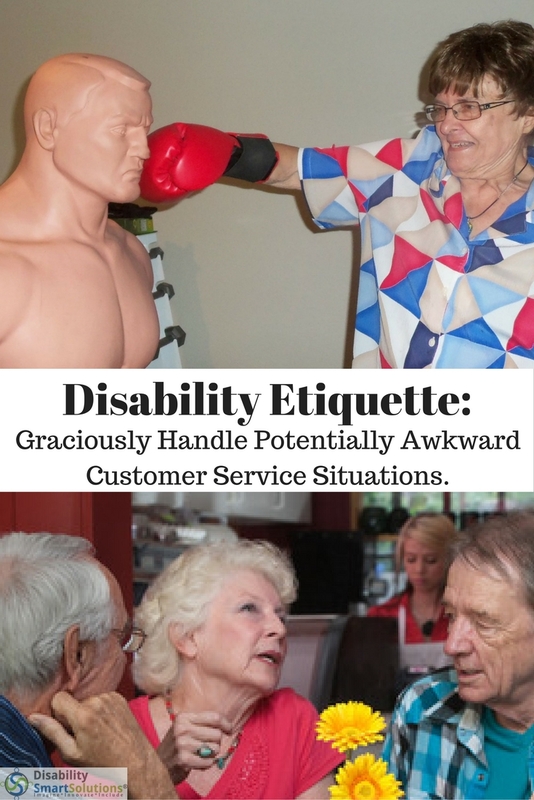 Is your trained for Disability Customer Service? Do they know what HOT to say to a person with a Service Dog? Is staff ADA trained to know the 2 questions are allowed to ask? 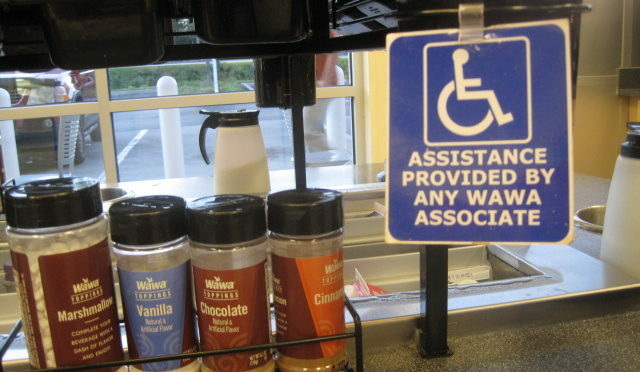 Do they know that they are NOT allowed to ask a person their disability? Recently, while traveling with a physically disabled friend and her service dog chihuahua, I was stunned by the audacity of business managers, in both a fine dining restaurant and a 4-star hotel, who demanded written service dog documentation and asked specifics about her disability. ADA Litigation and public media should teach us not to judge who has a FAKE SERVICE DOG but to graciously welcome all guests. 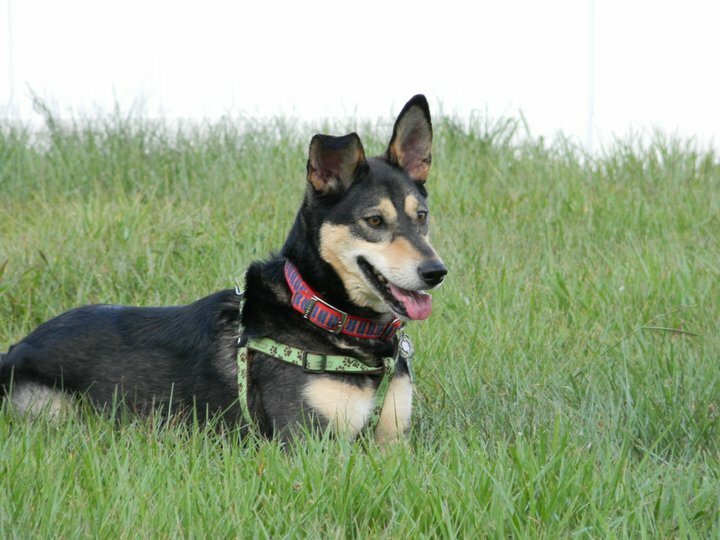 Random judging service dogs by breed impacts people with non-traditional service dog breeds. ANY DOG, including REAL Service Dogs, that is unruly, has bad public manners, is not house-broken, is aggressive, or gets on the furniture or merchandise, MAY be asked to leave. The dog owner is also responsible for the cost of damages. Legally ANY business may ONLY ask two specific questions. Likewise, these are the only two pieces of information that the Service Dogs Owner needs to give. 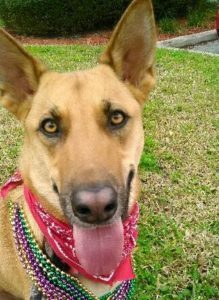 (1) Is the dog or service animal required because of a disability? 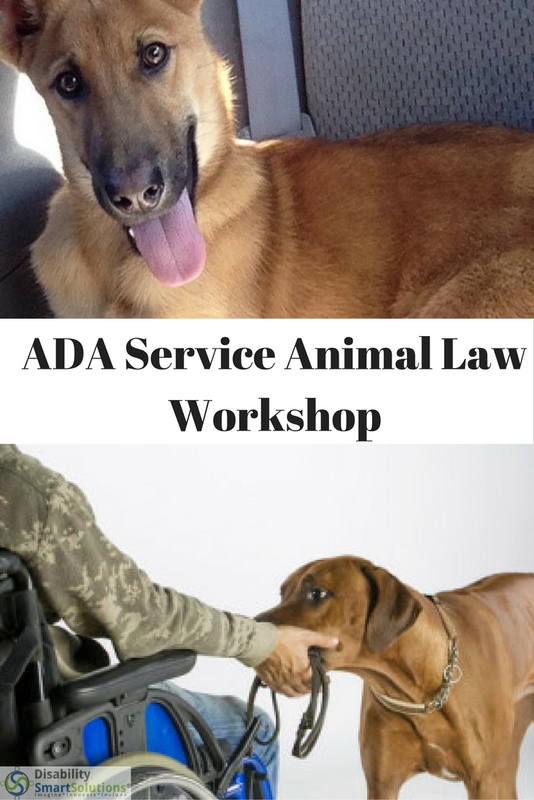 Note: Only dogs and some miniature horses are recognized by the ADA as Service Animals. 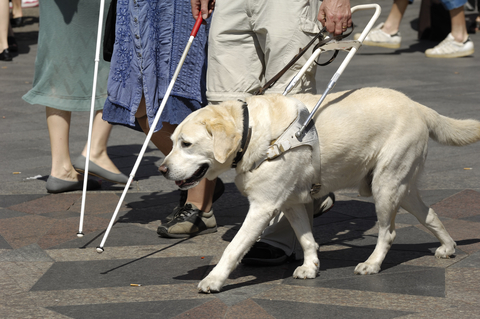 (2) What work or task has the service dog been trained to perform? 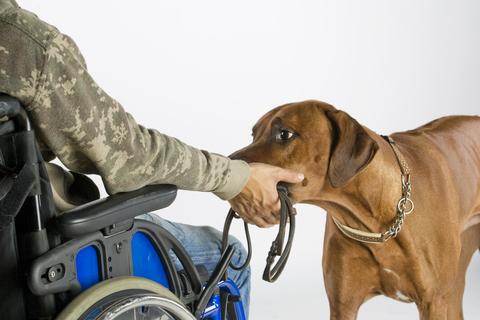 (2) Require that the service dog demonstrates its task. (3) Inquire about the nature of the person’s disability. 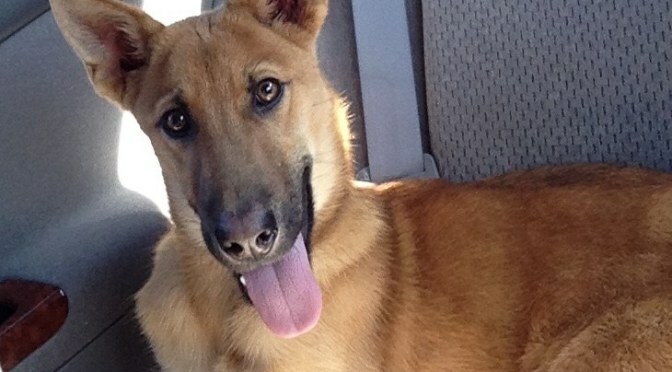 Service Dogs are expected to be Canine Good Citizens. 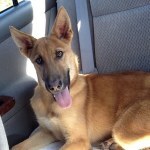 Service DOG handlers are responsible for their dog’s actions. 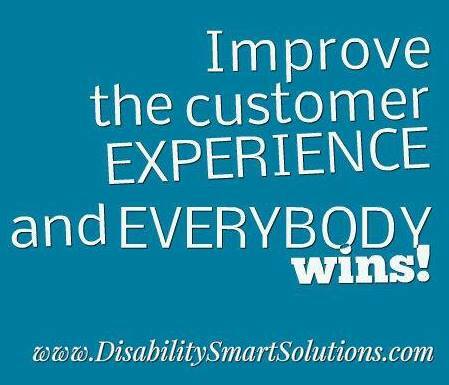 Through #DisabilitySmartSolutions, we offer disability friendly customer service training based on ADA Law. Fishing piers must meet the 2010 ADA Standards and the 2012 Florida Accessibility Code for Building Design. Beach sand is not in the Codes. Beach Sand is owned by the State of Florida. Our condominium clients hired our Disability Smart Solutions team to provide a compliance inspection report as a basis for their compliance action plan. 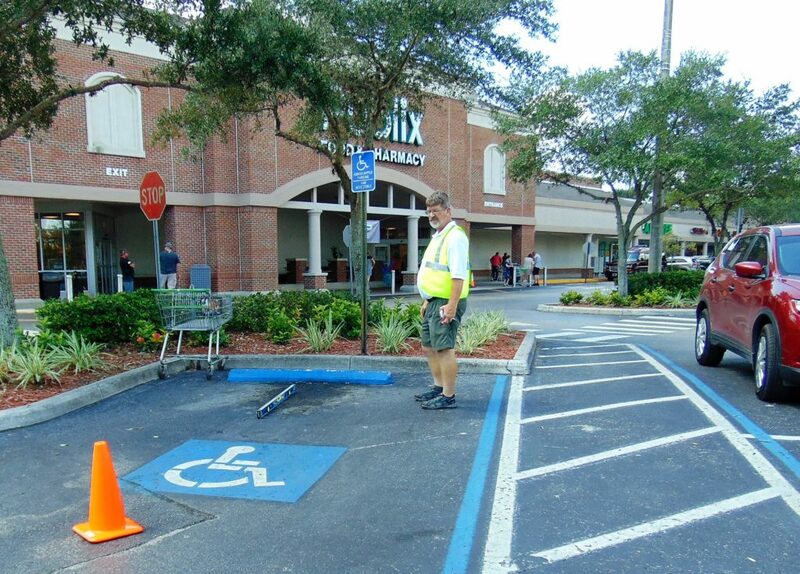 We inspected for both the ADA and the 2012 Florida Standards for Accessible Design. This pier is one of the oldest remaining PRIVATE oceanfront piers. This Condo Board is diligent in maintenance and wanting to meet or exceed ADA Standards. 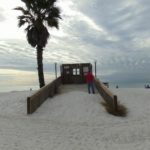 If allowed, they would clear the sand off of the ramp as daily maintenance. By beach laws (no specific reference), nature moves the sand and as a private entity,they may not move the sand. 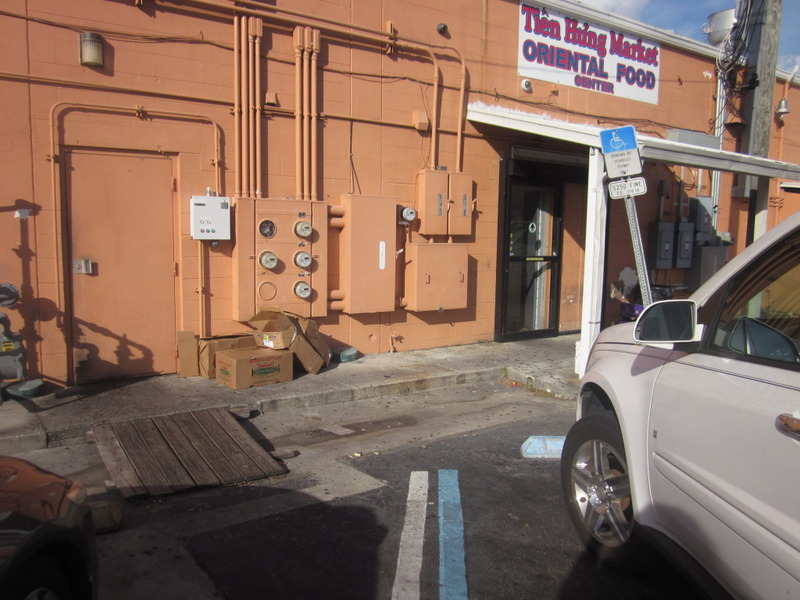 The more ADA Site Inspections we perform, the more conflicts we witness between Codes. 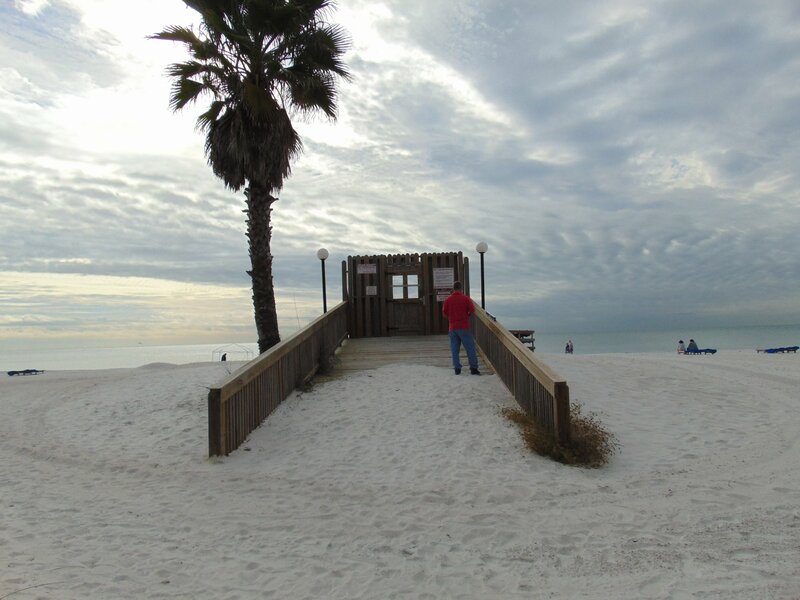 Some of the Accessibility upgrades for this Fishing Pier include adding hand rails, adding an accessible bench and accessible adjustments to the gate latching system. 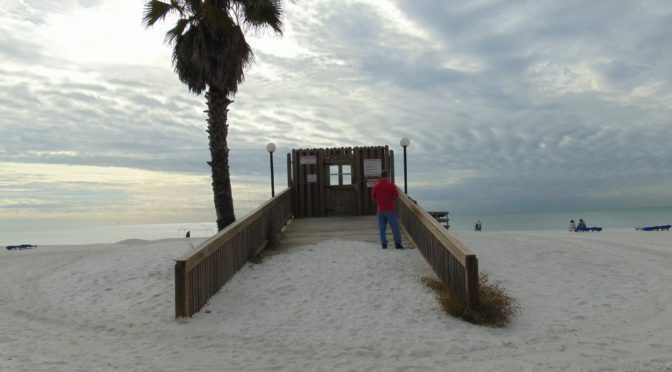 A new wheelchair accessible fishing spot is in the works for the center of the ocean end. 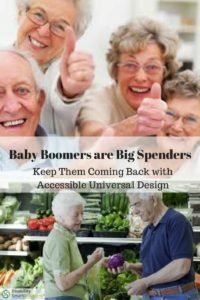 The Baby Boomers have money to spend but are slowing down from physical changes.The population of people who live with disabilities is 18% of the American population and growing. Our trainers teach you the culture and special needs of different disabilities including Hearing, Vision, Mobility Impairments, Hidden Disabilities (Learning Disabilities, Autism), as well as the special needs of people who have had the recent onset of a Disability. 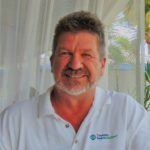 We teach you the tools and techniques for unexpected and occasionally stressful new situations. We discuss gracious solutions when important instructions must be followed, when conflicts occur and when clear communication is essential. We practice real life examples with appropriate solutions. Workshop participants increase their confidence and learn competence to serve the 50+ Senior and people living with disabilities consumer segment. We are now scheduling for our 2016/2017 Disability Customer Service Workshops. 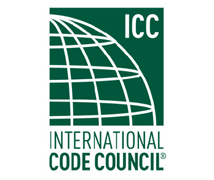 We are available as a Florida Conference Speaker, as well as throughout the US. All workshops are customizable for our client’s audience. Please contact us to review your needs. 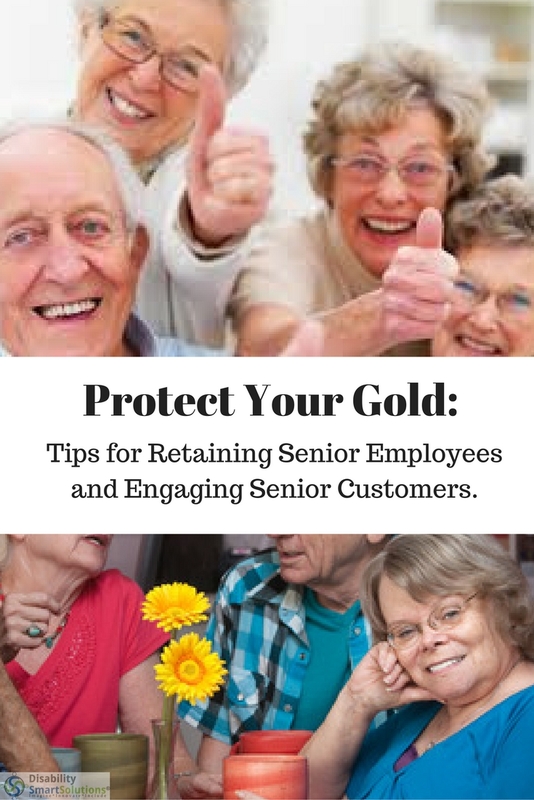 We discuss tips to keep aging employees comfortable and feeling valued. We review sensory issues like sound, temperature, ergonomics, furnishings, lighting, parking, movement breaks, and more that lead to increased productivity through a comfortable supportive environment. We discuss pathways of travel, furniture sizes, and restrooms relative to a population that is increasing in physical size. We discuss how to create a supportive corporate culture where employees are comfortable revealing their changing physical needs. Seniors are computer savvy. 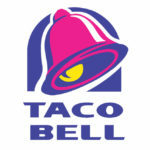 They research restaurants, stores and resorts before they buy. They post more on-line reviews than any other group. Great customer service is essential. Everyone wants to feel forever young. 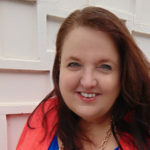 Is your business comfortable for people with reduced mobility? 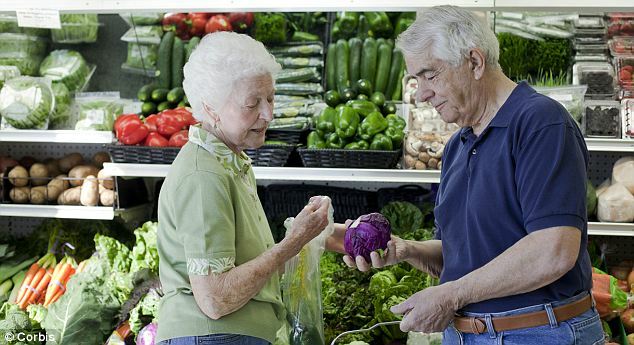 Do you know how Seniors choose where the dine, where they shop and where they go on vacation? Do you know what to do to keep them coming back? 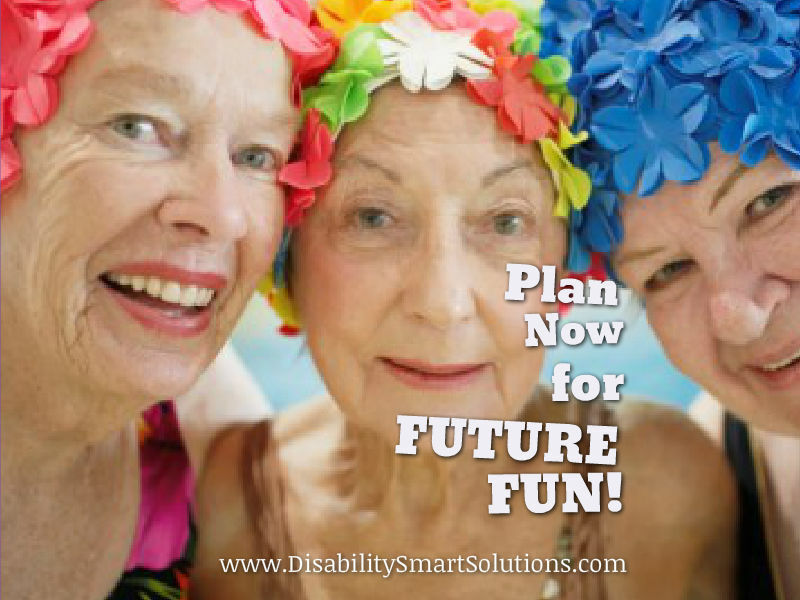 Why should you care about seniors? 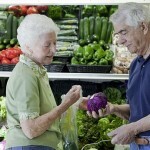 First, they’re growing in number: By 2030, nearly one-fourth (22 percent) of Americans will be over age 60. Second, they’re growing wealthier: Worldwide, the share of income for those over 60 is increasing and will continue to rise through 2020. And seniors spend proportionately more of their income on discretionary purchases like eating out than do other age groups. Only 5% of people who live with disabilities are wheelchair users. Arthritis is one of the most common disabilities shared by Boomers. Diminished hearing, diminished eyesight and diminished range of motion for stepping all affect the way that Boomers perceive space. In this training, we talk about sensory issues and simple changes in lighting, furniture placement, sounds, textures, materials, colors, signage, temperature and other often “taken for granted” design elements may enhance the baby Boomer Consumer experience. This workshop will give you the tools to make simple changes in your facility and customer service module to increase your engagement with 50+ Seniors. 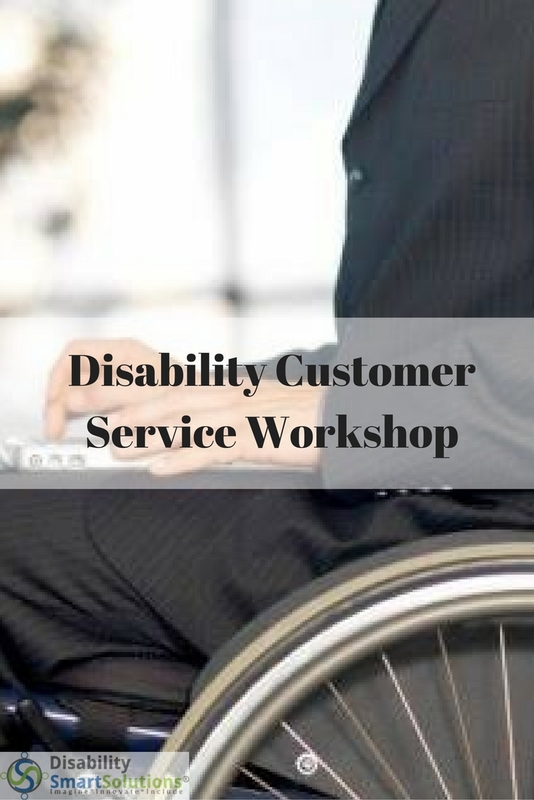 We are now scheduling for our 2015 Disability Customer Service Workshops. We are available as a Florida Conference Speaker, as well as throughout the US. All workshops are customizable for our client’s audience. Please contact us to review your needs. 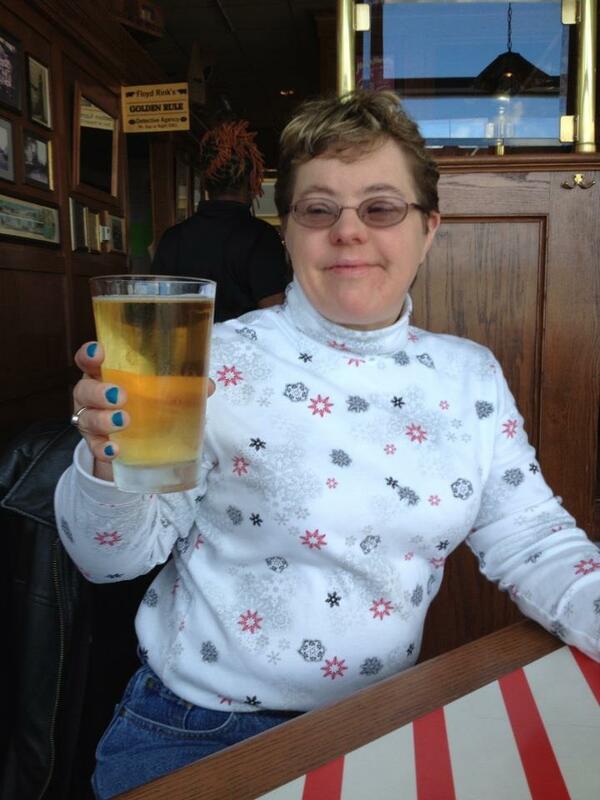 People who live with disabilities enjoy restaurants, bars, casinos, museums, recreational facilities, travel, and shopping just like everyone else. Our training workshop teaches businesses techniques to Engage all ability consumers. 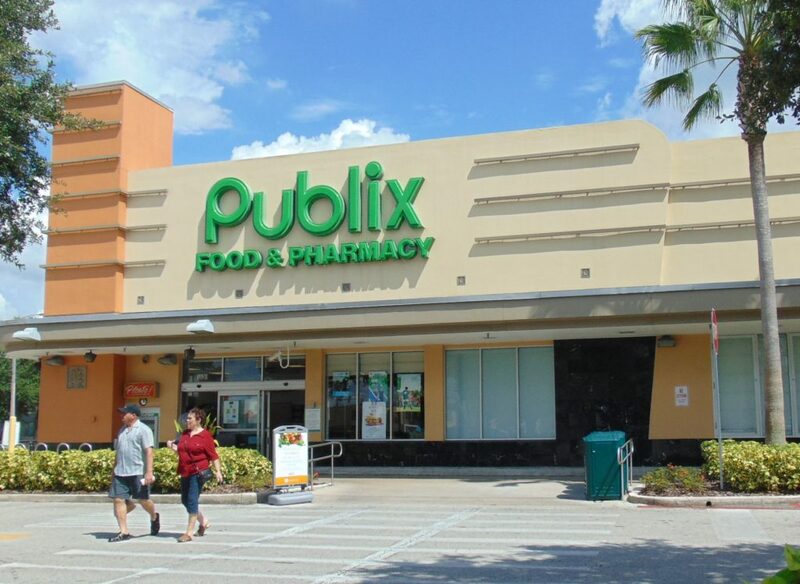 Disability Smart Solutions provides highly interactive presentations focus on building and retaining new business, increasing loyalty, diversity, excellent customer service, and empowering employees to welcome senior customers and consumers living with disabilities. 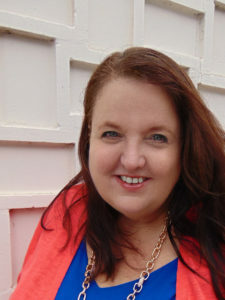 “Increase Your Bottom Line By Engaging All Ability Consumers” is one of our most popular speaking topics for 2015. Meeting planners can find all of our Workshop topics, speaker fees and type of presentations by following the links. 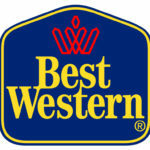 We offer many bonus items to add marketing value for meeting planners. Please contact us. Did you know that only 5% of people who live with a disability are wheelchair users? 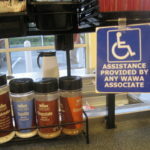 When improperly trained employees make assumptions because of a person’s physical appearance that may result in an ADA discrimination situation. Smart people might look different and people who appear “perfectly healthy” might live with hidden disabilities. We never know about a person’s physical and mental abilities or disabilities just by looking at them. Excellent customer service for everyone is key to a successful business. 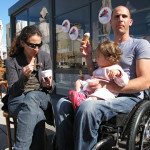 Do you know that of the 69.6 billion people in America, 28.7% of families have at least one member with a disability? 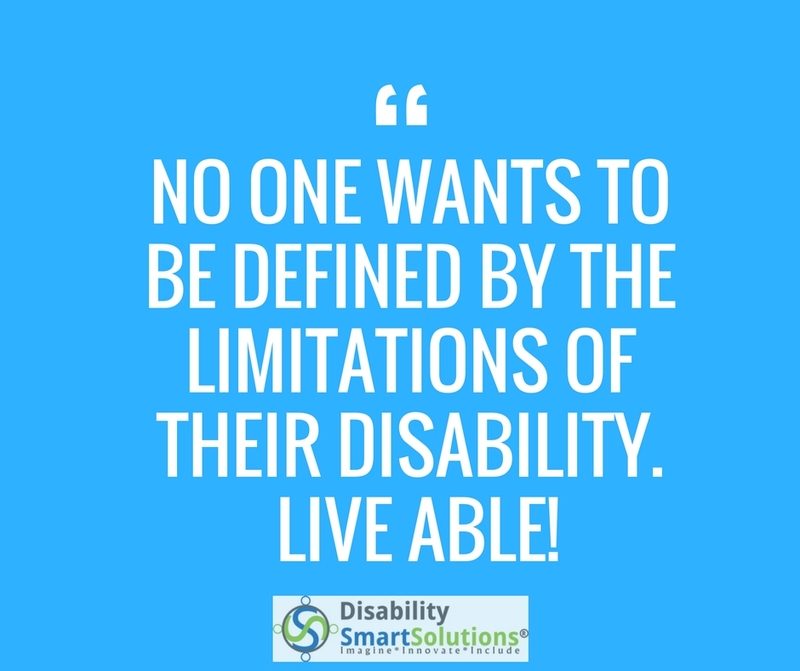 Do you know that people with disabilities constitute our nation’s largest minority group and they are the only group that anyone could become a member of at any time? This training demonstrates ways to engage and retain consumers who live with different types of disabilities. 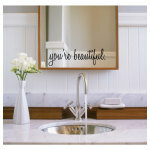 We discuss communications skills, customer service, disability etiquette and how to avoid unintentional discrimination. 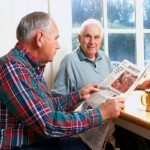 We dispel assumptions about the aging baby Boomer population. We practice different situations and discuss different ethical questions in this seminar. We discuss common situations that lead to ADA accessibility discrimination litigation. Participants gain the tools to understand different disabilities and how to engage loyal customers. Participants learn the financial power of 50+ Seniors and people who live with disabilities. 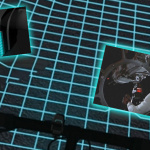 We are now scheduling for our 2015 workshops. All workshops are customizable for our client’s audience. Please contact us to review your needs and get on our schedule. Tom and I recently visited Give Kids the World, an accessible resort that provides memorable, magical, cost-free experiences to children with life-threatening illnesses and their families. 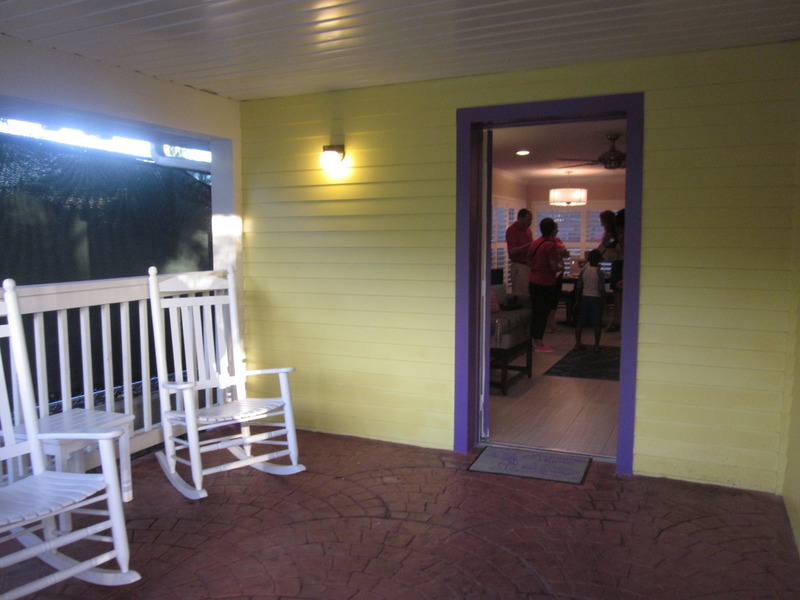 We were guests of GKTW for their Central Florida Bloggers Bash, sponsored by Mom it Forward and Central Florida Lady Bloggers. 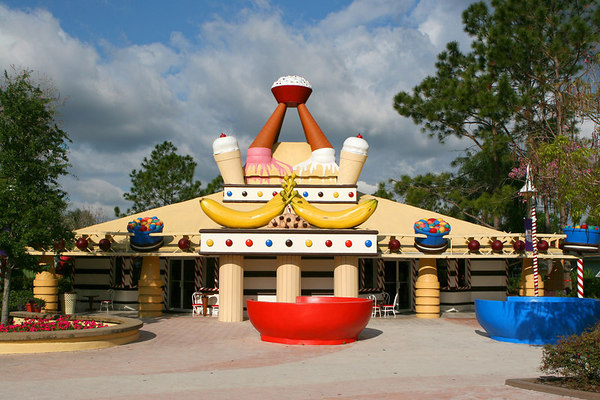 One thing few people know about me is that in the late 1980’s, after leaving Disney’s Live Show Design department, I joined the architectural studio of Benjamin P. Butera, AIA. 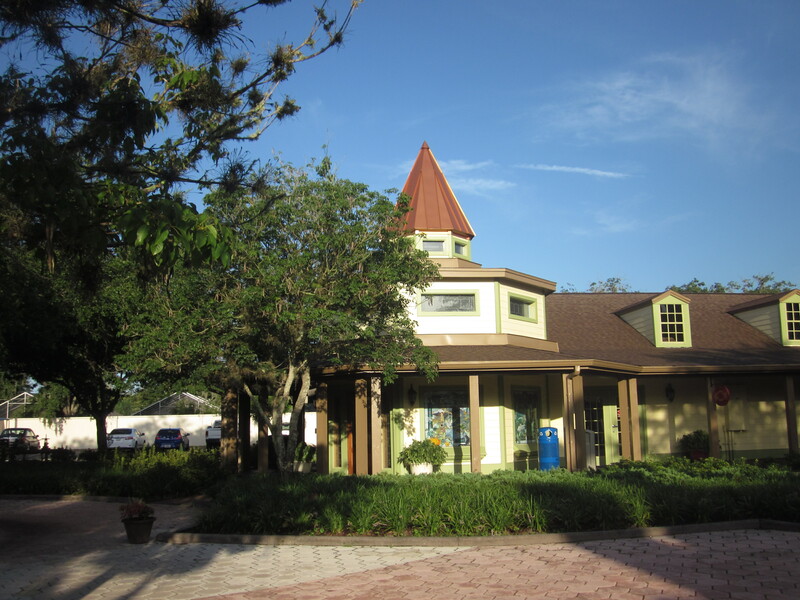 Ben is a visionary architect, who worked alongside GKTW founder Henri Landwirth in the original planning and design of the village. 26 years later, Ben is still on the team. I was lucky enough to be part of that original design team. I always recommend Henri’s inspiring autobiography “The Gift of Life” to anyone starting a non-profit or anyone who is wondering how they can make a difference in this world. 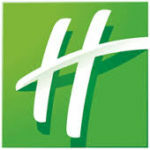 The story starts with Henri’s life as a young prisoner in the WW2 Holocaust concentration camps, his survival and journey to working in hotels in New York, to finding his twin sister in America, to managing the hottest Florida space coast hotel during the Space Race of the 1960’s, to developing his Holiday Inn in the early Walt Disney World days, to founding Give Kids The World. His friends Walter Chronkite and astronaut John Glenn wrote the foreword and afterword. The book is an inspiration for everyone to do their best. Good architecture always accommodates and serves all people. When you see a need, create the solution. 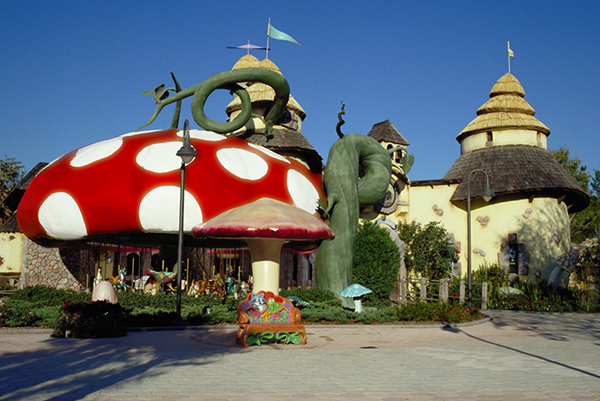 The gates of GKTW opened in 1989. 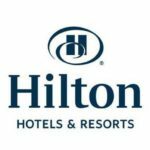 Today the Village is a 70-acre resort with over 144 accessible Villas, accommodations, entertainment attractions, whimsical venues and fun designed specifically for children with special needs. With the help of many generous people, companies and partners, Give Kids The World has welcomed over 132,000 families from all 50 states and 75 countries. The Give Kids The World Gingerbread House Restaurant. 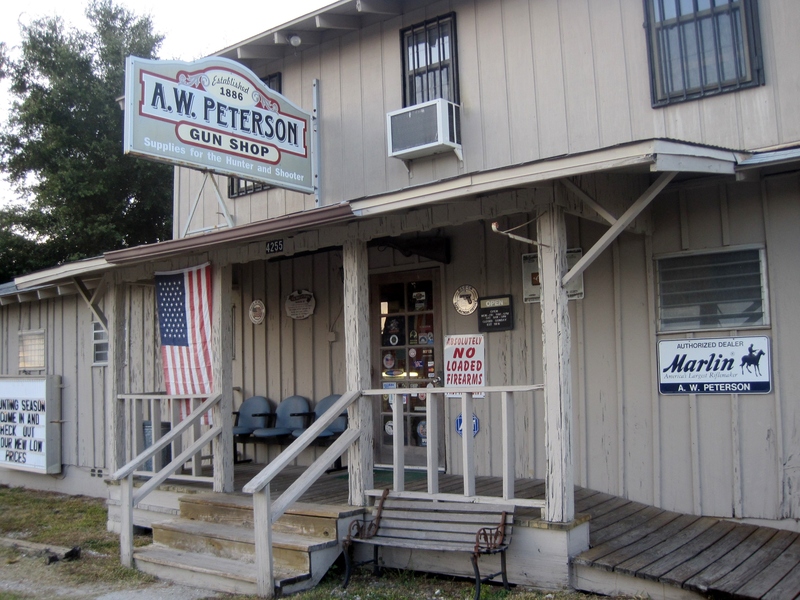 The original building had a simple gable roof. The parts on the top were built to add character. The roof is supposed to look like cake frosting and the beam at the entry is a vanilla wafer. 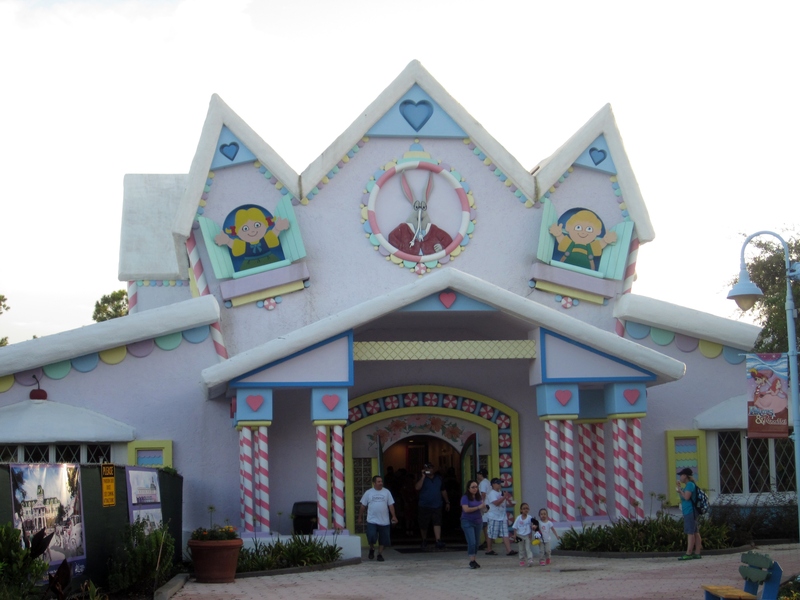 The Gingerbread House restaurant is a recognized symbol of Give Kids The World. Child-sized tables decorated with 27,000 real peppermint candies, over 2,000 dolls from around the world and the thoughtfulness of Angels (volunteers), all make the Gingerbread House more than just a restaurant. One day Ben was handed me the blueprints for Ginger Bread House restaurant that Perkins donated to Give Kids The World It was a very ordinary looking commercial style building with some Victorian brackets here and there. It was nothing special at all. From my quick marker and pen sketch, the iconic GKTW gingerbread house was born. 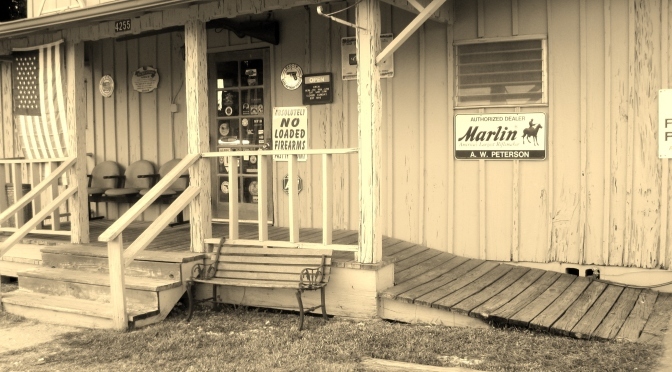 Little did I know at that time, that this building would be recognized around the world as a place of loving and caring. One of the early projects we designed were the original accessible resort Villas. 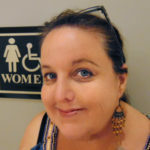 I was still single then and had no clue that children living with a disability or life-threatening disease might have to shower flat or require the assistance of two people to bathe. This is where I first learned that accessibility is much more than what is written as the acceptable minimum standard in the Federal ADA, American With Disabilities Code. Visiting a new villa was a highlight. 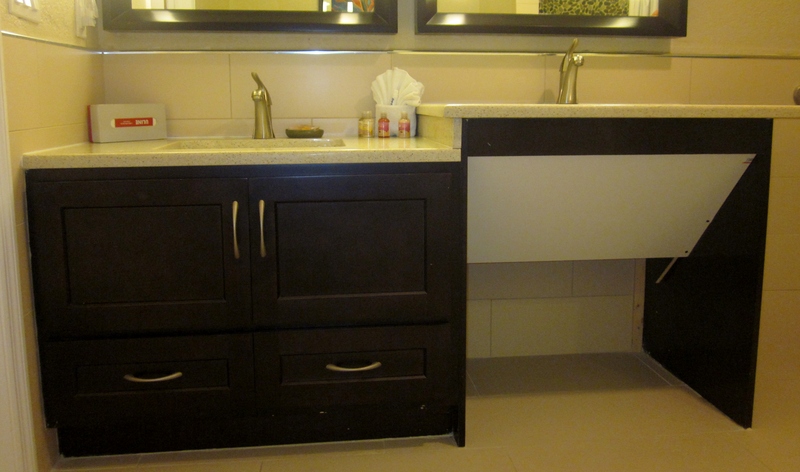 The guest suites of this accessible resort take all abilities into consideration in the design. Here are the photos. Since kids usually take baths, this unit is designed with a large bath tub. The shower doesn’t have grab bars. 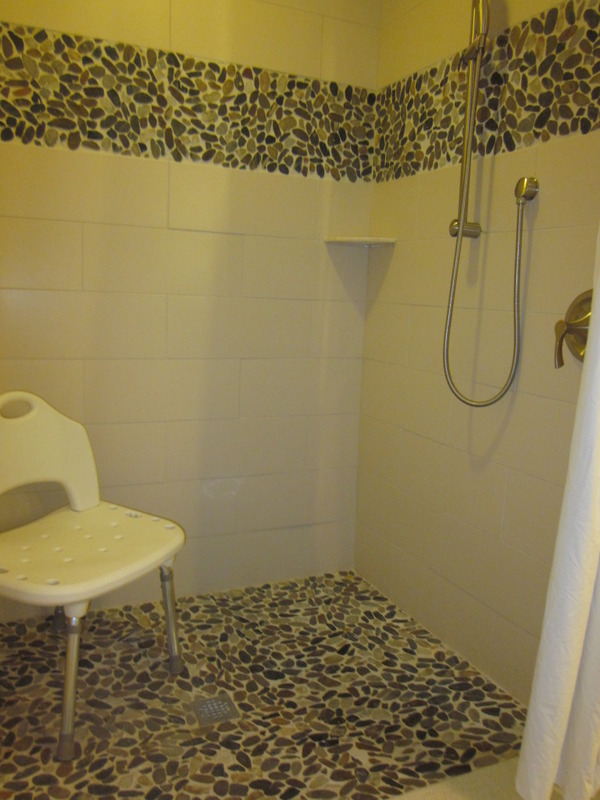 Often children who are wheelchair users use a shower chair and have their parents assistance in bathing. The handheld shower is the important part. 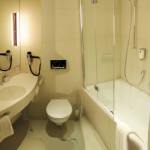 I was surprised that there wasn’t a hand held shower at the tub to assist with bathing or a slide bar at the shower to position the shower head. 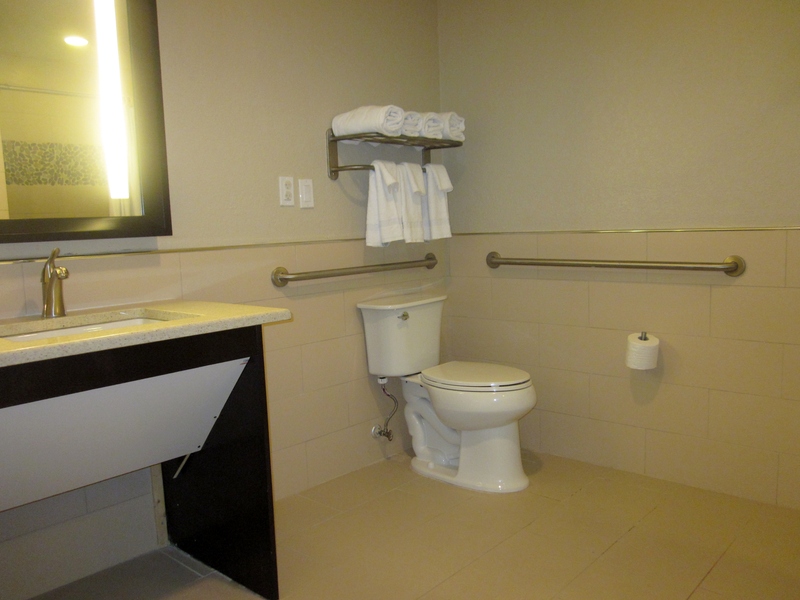 The large accessible toilet is set up for an easy transfer. The accessible sink vanity is higher with a lever faucet and knee protection from hot plumbing pipes. The adjacent sink is a little lower to accommodate children. All of these features are part of Universal Design. 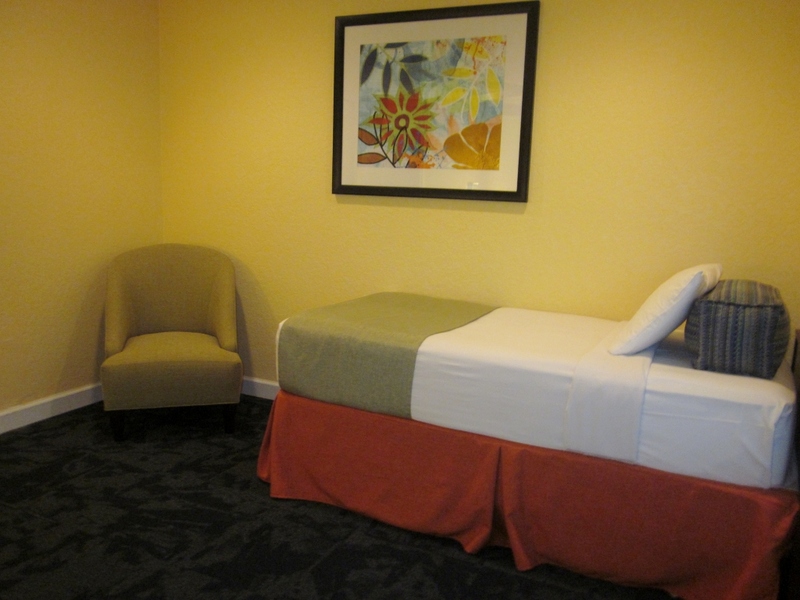 The accessible resort cheerful kids room has two twin beds and plenty of space to roll around or play. The beds are high to accommodate sliding a hoyer lift under the bed for transfer. The accessible resort kids room has plenty of space to move around. The bed is raised to fit a hoyer lift to transfer a child. The front porch of each accessible villa provides a smooth transition from the sidewalk through the front door. 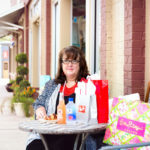 We enjoyed tasting Gigi’s Cupcakes as we toured universally designed villa. Give kids The World accessible villa. 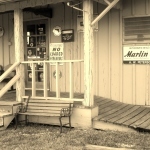 Notice the smooth transition in floor surfaces and the huge front porch. We didn’t get a chance to walk inside the chapel during this visit. 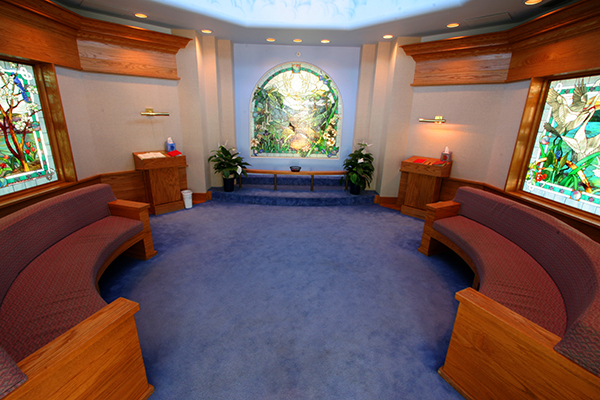 Henri Landwirth requested that we design a chapel so that the parents would have a place of peace. We designed it as a Victorian tower added to the existing administration buildings. I learned that for many of the children, their last wish is to come to Disney and meet their favorite characters. 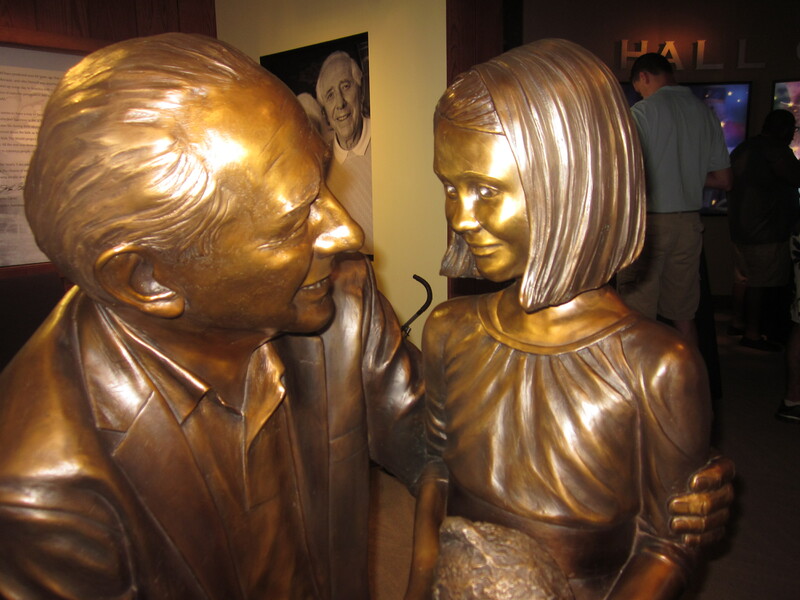 Some have even passed away in the arms of their wish character or while visiting GKTW. Every night the GKTW village celebrates a different holiday like Christmas, Easter, and Halloween. They try to pack as many happy memories int as short a period of time possible. Having a place for prayer and meditation offers a place for release. GKTW chapel. I designed the chapel with Benjamin P. Butera architects in the late 1980s. The chapel anchored the existing administration building. The hexagon shaped chapel has 4 huge stain glass windows representing Spring, Summer, Autumn and Winter. There is a ring of hand painted clouds above leading to heaven. Every night there is a pool party with music, bubbles, and a D.J. The evening when were there it was a pirate themed party. You can see the pirate ship in the background. 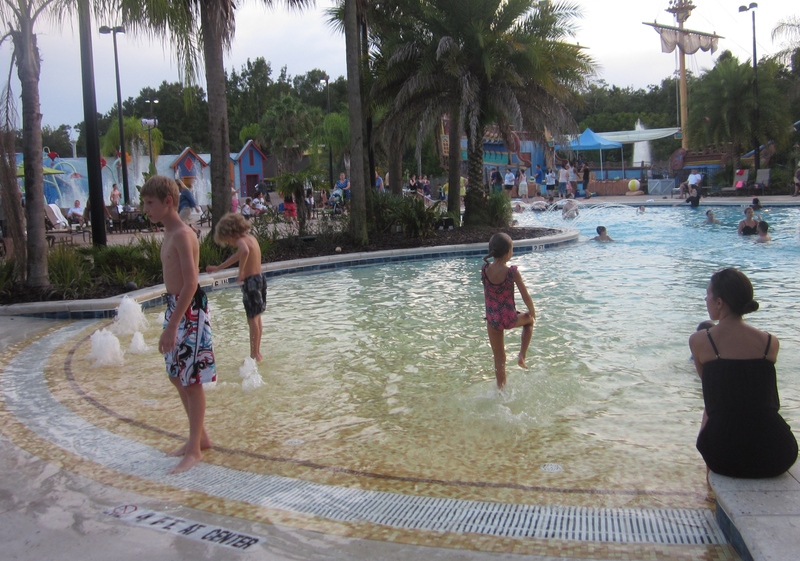 There are PVC wheelchairs for kids to use to just roll right into the accessible walk-in pool or the water park. 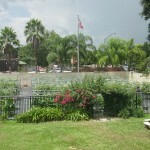 Accessible walk in or roll in pool. 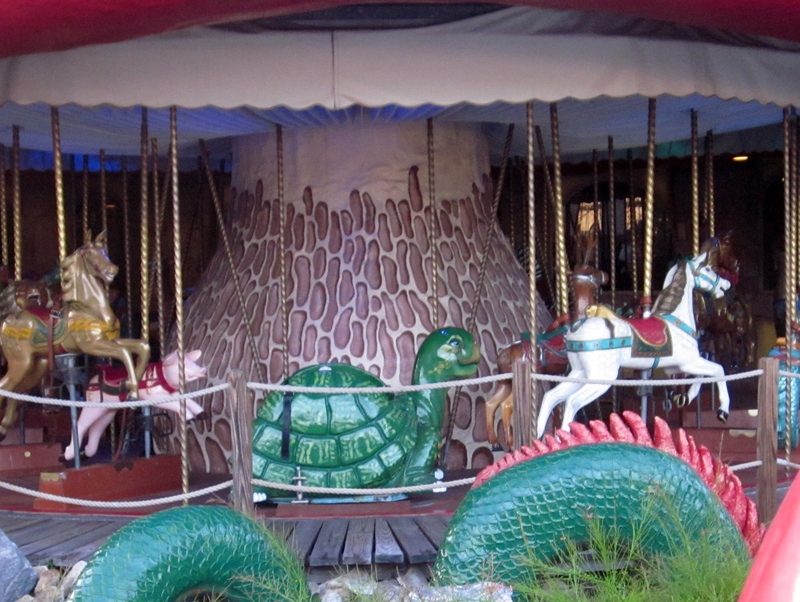 A wheelchair can slide inside the turtle for a magically enchanted carousel ride. One of our favorite venues is the Castle of Miracles and Enchanted Carousel. The Castle includes Twinkle Hope’s La Ti Da Royal Spa, a mysterious forest to explore, Father Time, a Wishing Well that burps, Rusty the friendly guard and a Great Hall full of magic. Waiting for all Wish Children is the Star Fairy, who magically soars into the night placing the Gold Stars on the Castle ceiling. Even children who are wheel chair users can enjoy sitting in the turtle on the merry go round. The Ice Cream Palace serves Ice Cream Morning Noon and Night! 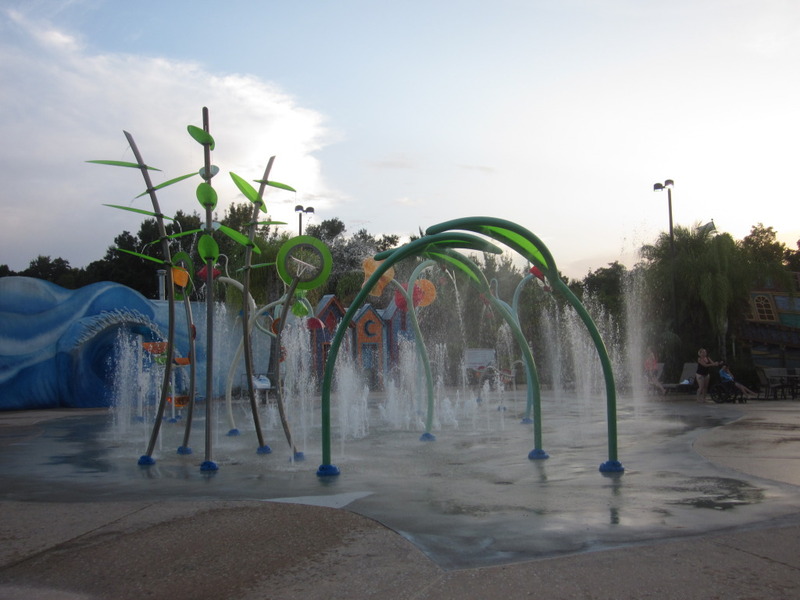 Give Kids The World ensures that every venue, activity and villa fully accommodates all of our precious guests. From The Park of Dreams pool to The Garden of Hope pathways, everything at GKTW’s whimsical Village is wheelchair accessible. A former wish mom recalls her family’s wonderful experience here at the Village. “Our stay at GKTW was amazing and I wouldn’t change a thing. Everyone was so compassionate, thoughtful and treated us like a member of their family. It’s amazing to visit a place that meets the needs of such special children. 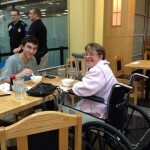 There are not many places, which we go to as a family, that accommodate wheelchairs. Our family was so happy that my daughter could partake in the same activities as the other family members – even swimming and horseback riding! I would like to thank GKTW for this beautiful experience,” – former wish child, Juvollia’s family.king my daughter’s wish come true but for fulfilling my dream of keeping my entire family together. You have touched our hearts and we will . 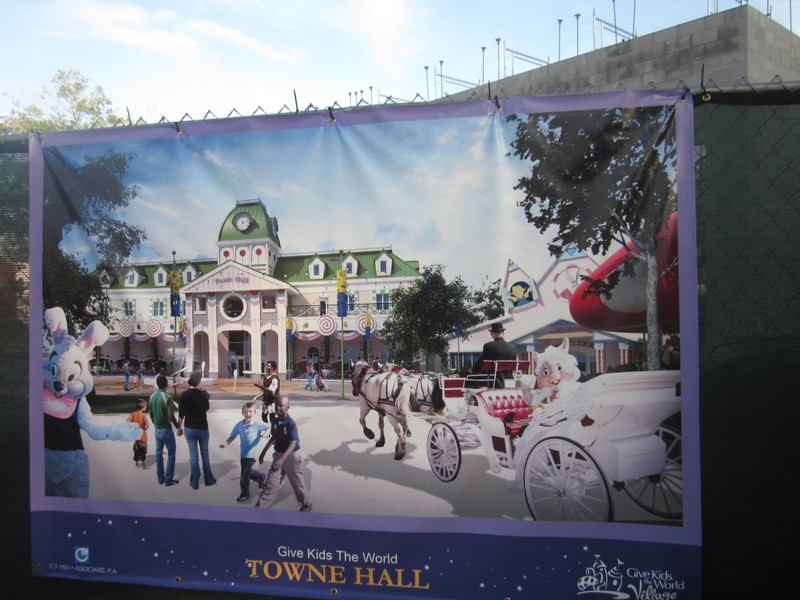 The New Town Hall at Give Kids The World will add new dining space. 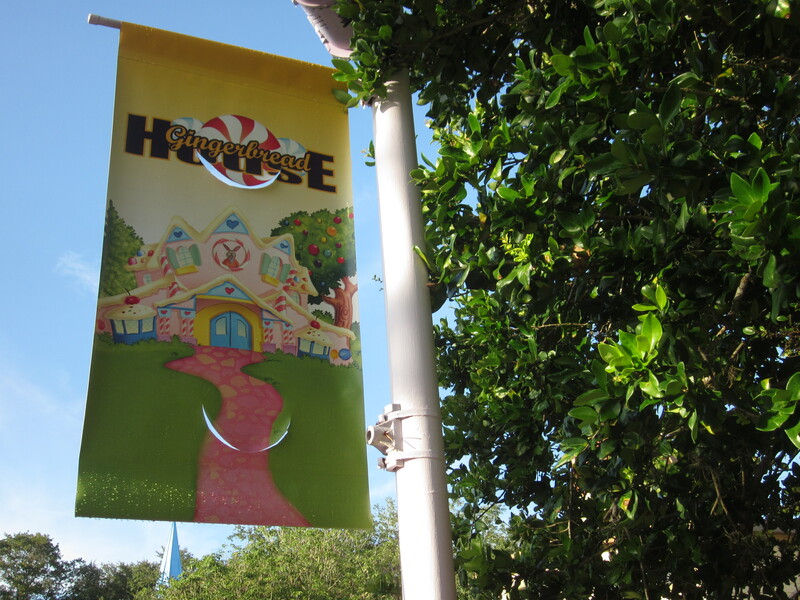 The existing Gingerbread House restaurant has gotten too small for all of the families and guests that visit each day.